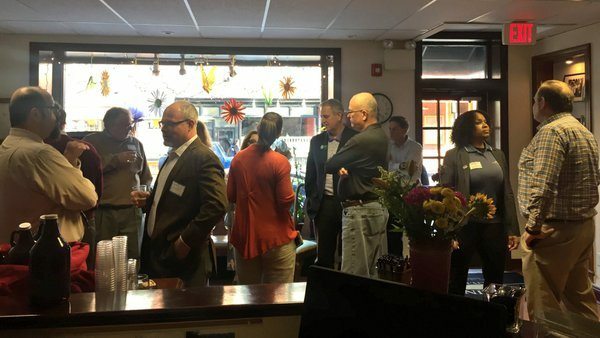 On Thursday April 14, the Zukin Realty office was honored to hold a Greater West Chester Chamber of Commerce business card exchange. We had record breaking attendance, thanks in part to the incredible refreshments that are provided by our commercial tenants. This year we had dishes from Yori’s Bakery, Social Lounge, Boxcar Brewing, Saloon 151, Cozy Kebab, The Pita Pit, D’Ascenzo Gelato, i-Pasta, Ram’s Head, Limoncello, Kooma, Pietro’s Prime, The Olive Branch, Doc Magorgans, and Mercato. This has turned into an annual event here at Zukin Realty, so keep an eye on the calendar for next year’s event.